The Tom Joyner Fantastic Voyage cruise (my Fantastic Voyage 2005 Trip Report) left from San Juan, Puerto Rico on the Sunday before Memorial Day. It was the responsibility of each passenger to make arrangements to be in Puerto Rico before the ship left. The airfare was not included in the price of the cruise. Traci and I had never been to Puerto Rico so we decided to arrive two days early and do some exploring. 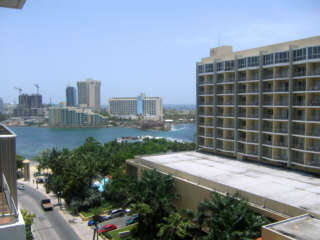 We stayed at the Wyndham Condado Hotel which was a recommendation from my brother, Mark. We had a nice spacious room that had a living room, bedroom, and two balconies. This hotel was the busiest I've ever stayed in. Everyday there were wedding receptions, formal balls, and graduation parties. In addition to these private functions, there was a casino, several restaurants, live music every evening, a small beach area, a pool, and gift shop. The hotel was buzzing with activity around the clock. 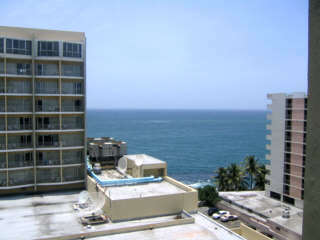 The hotel is located on the famous Condado strip. There are restaurants, hotels, shops, and night clubs all along the street. I don't think anything closes in this area. Traci and I found ourselves eating appetizers and dessert in a packed Chili's restaurant at 1 a.m. while listening to a live grunge band. The Wyndham Condado Hotel is not a place for someone who wants a quiet, relaxing getaway. We were on the ninth floor of the hotel but could still hear car horns and the boom of the bass from the cars with the mega-wattage stereo systems at 3 in the morning. We didn't mind though. All this activity helped prepare us for the party atmosphere of the cruise. To add to the hustle and bustle of the Condado Strip was some type of gay pride celebration going on that week. This explained the huge population of gay men we saw in the airports, the hotel, and along the strip. 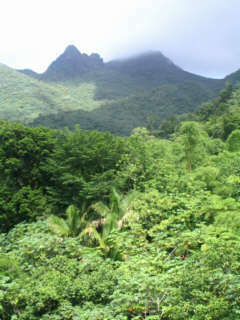 We signed up for the El Yunque Rain Forest tour at our hotel tour desk. 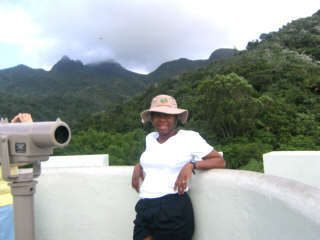 This excursion consisted of a 45 minute drive to the El Yunque Rain Forest. 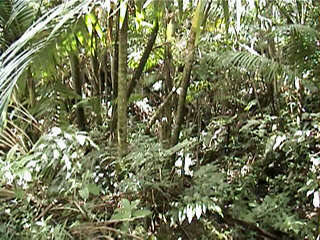 Once there, we were driven up the winding mountain roads and made a stop at the Yokahu Tower and at La Coca Falls. We walked up the 90 or so steps of the tower and got a panoramic view of the rain forest. 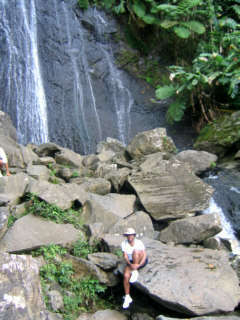 La Coca Falls is a small water fall. We just took a few pictures and moved on. This tour also included a 30 minute hike along one of the paved trails in the forest. Our guide pointed out the different varieties of plants and trees. The most interesting part of this hike was our tour guide who knew how to whistle and cause the coqui frogs in the area to begin chirping. Traci and I weren't all that impressed with the El Yunque Rain Forest excursion. We definitely don't think it was worth the $45 per person. I got the feeling that the rest of the people on our tour bus didn't think highly of this excursion either. When our bus driver asked if we were interested in making another stop there was a unanimous "No! Take us back to the hotel!" Old San Juan is known for its narrow cobblestone streets and the colonial Spanish architecture of its buildings. However, what seems to overshadow all this history is the large variety of stores and restaurants. The stores are no different than what we are used to at home, i.e. The Gap, Marshall's, etc... There are also specialty shops like Liz Claiborne and Gucci. The restaurants range from expensive outdoor cafes to fast food and chain restaurants like McDonald's and Pizza Hut. We had originally intended to use the public buses to get to Old San Juan. It only costs a quarter to ride and there is a bus stop in front of the hotel. However, a couple we met on the rain forest tour told us the bus comes so infrequently that they got tired of waiting and decided to walk. Feeling guilty about our 1 a.m. meal at Chili's the night before, Traci and I decided to walk to Old San Juan also. It was an hour walk from our hotel to Old San Juan and pretty much a straight shot. The temperature was in the upper 90's and the humidity was oppressive. Traci and I were drenched in sweat by the time we got there - so much so, I was embarrassed to walk in the stores in this condition. We found a bathroom and dried off as much as we could. We spent the day shopping. Well, actually Traci did the shopping and browsing while I normally joined the other men sitting on the husband bench. We took a break and had lunch at Pizza Hut before resuming the shopping. All and all, it was a laid back day in Old San Juan. There was not much excitement until I decided to have a seat on a bench in the square while Traci was across the street shopping in Marshall's. There were several people relaxing in the square and there were also plenty of pigeons. I shared the bench with two elderly men who were conversing in Spanish with each other. As we were sitting there, three teenage boys sat on the bench behind us and decided to share their snack with the pigeons. Suddenly, I heard a loud clatter of about 100 flapping wings coming from all directions. The birds were landing everywhere. They even landed on the boys' shoulders and out-stretched hands. Out of the corner of my eye I saw pigeon walking along the top of the bench towards me. I leaned forward to make sure the bird didn't try to walk on my shoulders. All I could think of is having to walk around with pigeon poop running down my shirt. As I leaned forward and looked down, there were about 20 pigeons coming from under the bench and walking around my feet. I glanced at the old men who were now also leaning forward and surrounded by pigeons. The funny thing about the male ego is that as uncomfortable as the old men and I were with the situation, none of us wanted to be the first to leave the bench. Frankly, I thought I was going to step on a pigeon or two if I tried to walk away. Eventually, the boys ran out of food and as quickly as the birds had descended upon the area they took off to get to their next meal which was at the other end of the square where someone else wanted to share their food. Peace had returned to our section of the park with only a few feathers floating to the ground to remind us of what had just happened. The elderly men began chatting away again and I leaned back in the bench being ever so thankful for the calm. By the time Traci and I finished walking in and out of the stores in Old San Juan, it was getting dark. We decided to take the bus back instead of walking. The bus ride was about 15 minutes. 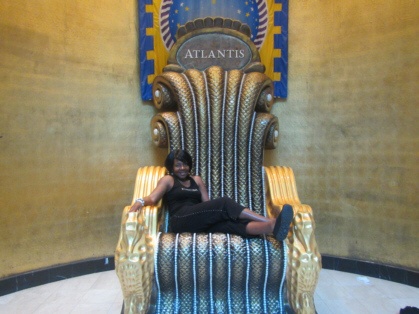 Sunday was the day we were to embark on the Tom Joyner Fantastic Voyage cruise. Our ship check-in time was not until 4 p.m. so we decided to kill some time by going to Las Americas Mall. It was about a 30 minute ride from our hotel to the mall on the public bus. We met Jose, a young local guy, during the ride. Jose was a friendly guy who appeared to be in his 20's. He was going to his father's apartment. He guessed right away that Traci and I were tourists headed to the mall. He told us about the bus route and made sure we knew where to catch the bus back to our hotel. He said he travels between Puerto Rico and the States quite often for work. He and his business partners are trying to get their cell phone technology business up and running. We chatted with him about his business and life in Puerto Rico until the bus reached his stop. I was impressed by Jose's entrepreneurial spirit at such a young age. Las Americas Mall is huge. In fact it is the largest mall in the Caribbean. Despite its size, the mall was packed. Jose had told us it would be. The stores are no different than the ones we're used to in the States. Traci browsed while I moved from husband bench to husband bench and eventually to the food court. I became more anxious as the time approached 4 p.m.. To add to this anxiety was all the traffic getting back to the hotel and the uncertainty of being on the right bus - no familiar landmarks. We eventually arrived back at our hotel and caught a cab to the ship. We arrived back in San Juan on Sunday, June 5 after spending seven incredible days on the Tom Joyner Fantastic Voyage cruise. 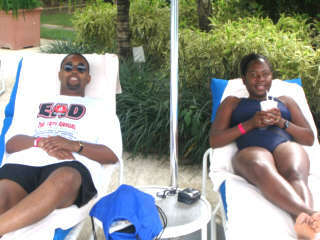 We had gotten very little sleep on the cruise because of all the activities, parties, and concerts. All Traci and I wanted to do was to sleep when we got off the ship. 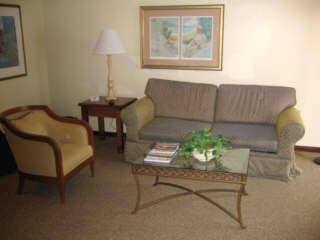 The Intercontinental Hotel turned out to be the perfect hotel for relaxation. 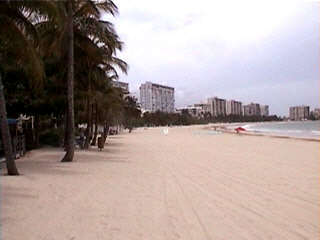 It is located in the less busy Isla Verde section of San Juan. I chose this hotel because a co-worker of mine raved about the Intercontinental he stayed in in Paris. I would have booked the hotel for our pre-cruise lodging but the rate was too high for the Memorial Day weekend. However, the rate was discounted 50% starting the Sunday after Memorial Day, so we chose the hotel for our two-day post cruise lodging. 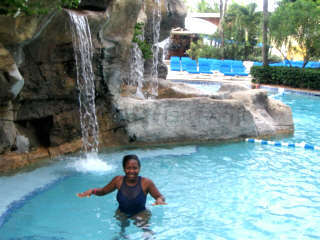 The Intercontinental was great. We had a decent-sized standard city view room on the 14th floor. From our balcony we could not only see the city, but we could also see the airport which was a 5 minute taxi ride away. 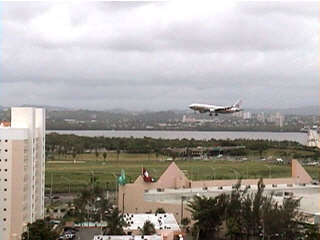 Traci and I enjoyed sitting on the balcony and watching the airplanes take off and land. The noise did not bother us. Across the street from the hotel is a small shopping center. 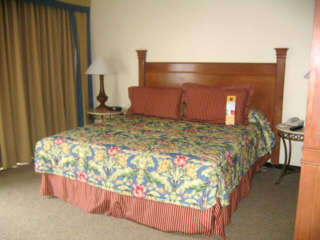 There are also other hotels, fast food restaurants, and chain restaurants. We ate at Ponderosa, Pizza Hut, and Outback Steakhouse during our two-day stay. We were never comfortable crossing the street in this area because there are no traffic lights. There are two lanes in each direction and no traffic lights. The cars are supposed to stop when pedestrians are crossing the street. They did in most cases, but it was still quite scary to us to just walk out in front of traffic like that. The Intercontinental hotel has many amenities. It has several upscale restaurants including Ruth Chris Steakhouse. There is a casino, a fitness center, and spa. Aerobic classes are given in the evening. There is a pool with waterfalls and a swim-up bar. To top off all these features is the access to the big beautiful beach behind the hotel. 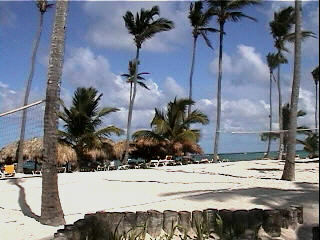 The staff will even ask where you would like to sit on the beach and then bring a beach chair to you. 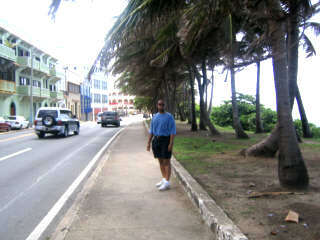 Exhausted from the cruise, we were in bed by 6 p.m. on the Sunday we arrived at the hotel. We didn't get out of bed until 9:30 a.m. the next morning. We spent the rest of our stay lounging on the beach and by the pool. We took a lovely stroll on the beach Monday night then came back to sit on our balcony to watch the airplanes land. 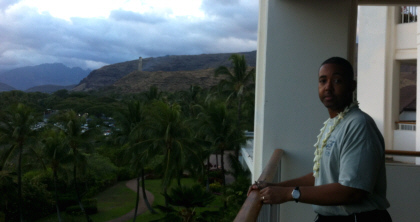 Our stay at the Intercontinental Hotel was a great way for us to unwind at the end of an action-packed vacation. "I can't believe we have to go to work tomorrow." You can read about our 2016 San Juan visit here.